Every Monday morning (and some Wednesday afternoons) I volunteer at the Norwich Cathedral. My official title is that of a “Cathedral Greeter” but in reality my duties are far vaster than that. When I met with Canon Pastor Richard Caper and Juliet Corbett in early April they told me that they were having trouble engaging the youth of the community in the Cathedral and that they thought that I would be a good person to help try to fix their problem. They decided that I should work as a greeter – a job that involves me talking to every person that comes into the Cathedral during my shift – so that I could be a demonstration of how the Cathedral can appeal to all ages, not just the elderly who tend to volunteer there. So, after what was quite possibly the most awkward hour of my entire life (coffee with the Canon Pastor took an hour but we talked for maybe a grand total of 35 minutes; the rest was uncomfortable silence with an occasional comment about the weather; he was quintessentially English and reserved and I was the nervous young American who was afraid to appear to brash and aggressive), I was put in touch with David Strawgner who runs the greeter program at the Cathedral. A few days later David gave me a call and asked me to come in so that I could get to know the Cathedral and so that we could arrange what days I would be there. David turned out to be a delightful older gentleman who has more passion for the Cathedral than most people have for their families. After an intense afternoon of seeing the ins and outs of the Cathedral and writing down every factoid that a visitor might want to know (ranging from where the bathrooms are to hidden mason marks around the Cathedral) I was given my badge and told to show up at 9:30 the following Monday morning. My first day, 18 April, I arrived fifteen minutes early armed with my official Cathedral volunteer badge and a somewhat nervous smile. I walked into the Hostery (the new more modern part of the Cathedral which is where visitors enter and where the greeters are stationed) and met up with David. David introduced me to Mandy, another greeter and my coconspirator for the morning, who has been disabled all her life and had been volunteering for almost a year. She said it was one of the two weekly activities that she does outside of her convalescent home. She also told me that she volunteered as a greeter as a means to try and build self-confidence. David, who was also with us to show me the ropes for the morning, told me about another woman who comes in during the week that was seeking the same self-confidence that Mandy was. The woman in question had been in an abusive marriage for many years and the Norwich Battered Women’s Shelter had sent her to the Cathedral to try and help her build not only her self-confidence but also her basic ability to interact with people as well as to regain her sense of self. According to David, as the months passed, this woman had learned to smile again and to be herself. I was beginning to get the sense that this was the true purpose of the Cathedral – not to act as a popular tourist destination, but to help the people of Norwich with whatever personal demons they were facing. My morning went without a hitch and I quickly got my schpeel down to a science: “Good morning! I’m Amy, I’m a greeter at the Cathedral, and here are a few things you should know…” I then tailor my speech to whomever it is I’m talking to. If it’s families with young children I point out the labyrinth outside in the cloisters which is a great place for families to play when the weather is nice; if it’s older couples I talk about the history of the Cathedral and the evolution of the newer parts of the complex (the hostery, the loqutery, and the refectory have all been redone in the last few years) as well as the conservation work that’s currently going on; and for everyone else I answer questions, give helpful hints for the self-guided tour that we hand out and generally try to give the impression that the Cathedral is a warm and welcoming place. During my first shift I mentioned to David that classes were over for the year and I was looking for more to do with my days so he told me that I should come in on Wednesday afternoon as well. Two days later I returned and worked with a lovely retired lady who had been volunteering for the last six months. She told me more about David, who was busy elsewhere at the time (he was finally convinced that I could welcome people without scaring them off). It turns out that David is finally starting to feel his age and that being at the Cathedral only makes it worse. His wife has begged him to stop volunteering (he is there all day, every day, constantly on his feet and on the move). But, David loves the Cathedral and refuses to leave it behind. He loves meeting the children that come through (he says that they remind him of his many grandkids) and welcoming strangers to the building he loves so much. This afternoon I also had my first encounter with what I’ve come to recognize as The Eccentric Old People Of The Cathedral (my term and not one I share with most the people I come across as they do tend to fit into this category). Basically an EOPOTC is an old and but impossibly interesting person who comes to the Cathedral. They tend to come alone (although there have been exceptions to this, see below) and are looking less at the Cathedral and more for an opportunity to interact with strangers. They are, without exception, an endless source of factual information as well tidbits of wisdom about life in general. EOPOTCs have quickly become the highlight of my time at the Cathedral and I harbor the hope that someday I can grow up to be one. While much of the basic facts of history are recorded in textbooks, the true tradition of Norwich –its tales and its character — are the possession of the EOPOTCs. They are the protectors and distributors of the stories of Norwich (and Norfolk in general) and they seem to possess this honorable sense of duty to impart what they know to the next generation as well as to act as sponges, collecting new information to be stored in the annals of EOPOTC history. They are the oral historians of England. They are also undeniably and unabashedly fun and can always be relied upon to elicit a smile. My first EOPOTC I found wandering around the hostery furtively glancing over his shoulder every few minutes as if he were afraid of something. I went over and asked him if I could help him in any way and he desperately asked if I recognized him. When I answered in the negative a look of relief rushed over his face. It turns out that 76 years ago, when he was just a “young lad,” he had been banned from the Cathedral for acts of “hoolaginism.” He staunchly refused to define “hoolaginism” to me or to in any way clarify the reason for his life long ban but he was clearly bemused by both my American-ness and my confusion. We chatted for a little while about Norwich and then changes he has seen in the community over his life-time and then he wandered off. That same afternoon was a funeral for a prominent Norwich businessman who had died suddenly and unexpectedly the previous week. First of all, I’ve never seen the Cathedral this crowded (before I started volunteering this term I had spent time there just looking around). Second, I took one of my first lessons at the Cathedral in the eccentricities of British culture: men in yachting clubs wear the most colorful jackets I have ever seen. In homage to their fallen brother, men of all ages and sizes had donned yellow, blue, and black vertically stripped blazers that had bright pink satin lining. It was like watching a herd of mourning peacocks. They were a walking oxymoron: solemn in attitude but bright in dress. There aren’t quite words to describe it but my fellow greeter and I decided that it was probably better that way. The next Monday I came in and was informed that, as it was a bank holiday, Mandy could not be there (she could not get transportation on bank holidays) and that another lady, Allison, would be with me for the next two weeks. First, Allison turned up an hour late. But when she did get there she walked into the hostery wearing a sundress, massive straw hat, fishnets, and combat boots like she owned the place. Allison is probably in her late thirties and she splits her time taking care of her elderly mother and a gentleman who is blind and an amputee. However, Allison’s true passion is art and when asked what she does, she says she’s an artist. It was a slow morning (there was an organ recital, which meant the main doors of the Cathedral were open and who wants to go through the hostery when the huge main doors are available), so Allison and I spent our shift chatting about everything from art in Norwich to medieval history and my focus of study (i.e. gender history). Allison is well on her way to becoming an EOPOTC (she is full of fun facts but at the same time a bottomless pit of curiosity; she grilled me for the better part of our shift about medieval history, Latin, and life as an American). I am sure that someday she’ll pop in just to chat with the next generation of Cathedral greeters and to impart stories of the olden days when she worked at the Cathedral with a somewhat shy but enthusiastic American student who knew a thing or two about medieval history. Nevertheless, she is extremely interesting and absolutely loves interacting with the people who come through the Cathedral. I also met my second EOPOTC. He was an older gentleman that I talked to for about half an hour and who could list every parish in Norfolk, its founding date, and how tall the tower was. Someday I hope to be such a font of information. He was one of those people who gives you the impression that he has forgotten more than you will ever know. The next Monday I came in and was, once again working with Allison (who was, once again, over an hour late). David was not feeling well so he left me in the hostery alone (for the first time ever!!!) to be the sole representative for the Cathedral. If a slow morning is one where maybe 5 or 6 families wander through, Monday morning can only be described as dead. I was so excited to be the first (and only face) that people met when they walked into the Cathedral – I had two cups of coffee (they give it to the greeters for free) and a huge smile – and no takers. When Allison came in at half past ten she was the first person I had interacted with since David left. However, people started pouring in (there was another organ recital but for some reason a majority of the visitors came through the hostery instead of the church doors). Monday also marked meeting my favorite EOPOTC (they really are a majority of our customers) to date. This man came in with his middle aged daughter and from the moment I saw him I knew that he was going to be something special. He was wearing bright yellow trousers, a pastel pink bowtie, and looked like Uncle Charlie from the children’s book Thrump-O-Moto by James Clavell (if you’ve never read it, go do so immediately). He introduced himself and assured me that he did not need the self-guided tour pamphlet for the Cathedral, as he was a trustee of it (and as it turns out everything else in Norwich including the Millennium Library and the Sainsbury Centre). When he realized that I was an American studying medieval history at UEA he became much more interested and talked to me for a good hour about Norwich, the buildings, the community and the general area as his daughter smiled in the background looking as though she could not wait for him to stop talking. Nonetheless, he was incredibly interesting and incredibly excited that I was getting involved with the Cathedral. He gave me his business card and asked me to get in contact with him if I was at all interested in getting a backstage tour of most of Norwich’s cultural sites (as a trustee of everything – no joke, he listed every building and organization I had heard of in Norwich – he promised that he could show me anything I wanted). I did not take him entirely seriously until I pulled out his business card this morning to write my blog and I noticed the initials “O.B.E.” after his name. “Order of the British Empire, eh? A surprise, actual, knight! ?” I googled him. Turns out he was sheriff of Norwich and a local real estate mogul who sold his company a few years ago for a vast amount of money and has dedicated his life to making Norwich and its culture more accessible. I fully intend to give him a call and see what I can learn. 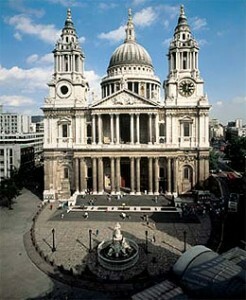 I am going to continuing volunteering at the Cathedral until I leave in early June. I absolutely love it. It is undoubtedly the highlight of my week. I have learned so much about the Cathedral itself, but more importantly about the people of Norwich. It has been eye-opening to interact with so many people from all walks of life: the tourists who come to see the haunting architecture, the bird watchers who flock in to observe the peregrine falcons that live in the Cathedral tower (coincidentally enough they’re hugely popular right now as one laid an egg on Easter just as the Pastor was talking about rebirth…gives one goosbumps), the EOPOTCs who just want to talk to someone, the scared young couples looking at the Cathedral as a possible location for their wedding, the movie crew that comes in and out (the Cathedral is closed next week for filming of James and the Giant Killer starring Ewan McGregor – yeah, I get to meet him!! ), my fellow volunteers (who are possibly the nicest people I’ve ever met and who function as a sort of large family) and everyone else. In particular, spending so much time with David has given me a new perspective on what it means to truly love a building and the people it houses as well as a new definition of loyalty and dedication to a cause. I’m sure that as the weeks go on and I continue to spend more time at the Norwich Cathedral I will not only learn more about the people I interact with, but about Englishness in general. Not to belittle Kate Fox, but I have learned more from my 20 hours at the Cathedral about Englishness and the English community than I did from all of her long explanations about British culture. I am beginning to realize that while some lessons can be taken from other people’s writings and observations, others can only be learned through human interaction and life experience. Total Hours: 15.5; with time done on 13 April (see other blog) a total of 20.5 hours. 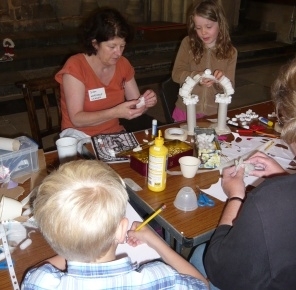 My first day at the Cathedral (not in my official capacity of greeter), involved working with local children during an open day full of Easter activities. I started by helping groups of kids make Easter baskets that they would later use to collect chocolate eggs in the herb garden. I really enjoyed the experience for two reasons. First, I love kids. They crack me up and these were no exception. Second, I love Easter. This is the first year I have not celebrated Easter with either my family or friends. At home we typically make a big to do about it – we go to church in the mornings, dye Easter eggs in the days leading up to Easter Sunday, and have what can only be described as epic Easter Baskets. At Dickinson I get two Easters. I celebrate one with my close friends (this typically involves eggs, baskets, and a home made brunch) and with the family I nanny for (Isabel, the little girl I watch, starts celebrating Easter weeks in advance with daily egg hunts). I was a little disappointed to know that this year I would probably go to mass on my own and then come back to UEA. Thus, being at the Cathedral and celebrating it with a multitude of very excited children absolutely made my day. 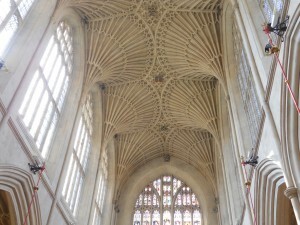 A few days before my morning at the Cathedral, Juliet Corbett had emailed me and asked if I minded doing something separate from my Dickinson colleagues. She asked if I would work at the Garden of Gethsemane station where I would give a short speech to the children and then help them make clay models of what made them feel afraid. The speech I gave discussed how Jesus must have felt alone and afraid in the Garden of Gethsemane when the disciples fell asleep the night he was arrested. I was then supposed to ask the kids to tell me what made them feel afraid. I had forgotten how original young children could be and I got answers ranging from spiders and school bullies to sausages. What is scary about a sausage is beyond me, but it definitely made me smile. By the time I closed up my station, even though it was not quite Easter and I was with total strangers, I felt like I had been party of a family celebration. After everything was tidied up all of the volunteers for the day met with Juliet to talk about what we felt went well and what we thought could use improvement. While I did not have any suggestions (I felt like the day had gone smoothly and that the kids seemed really happy), the open forum truly made me feel like part of the Cathedral community. Even though there was a range of people we all had this common ground: we were there because we enjoyed the Cathedral community and spending time with children. 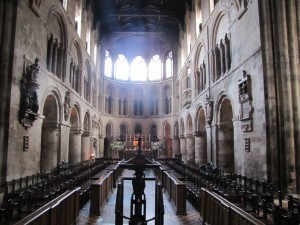 Throughout the entire month in London, people have moaned that the churches/cathedrals we went to were lacking: there was no spiritual awareness, that it was too touristy, etc. While this is true to some extent, I felt that we went as tourists, not inquirers, like we did when we visited the synagogue, mandir, and the mosque. We weren’t going to a local parish where they were as keen to brag about what went on there or where they felt it was strictly necessary to outline more of Christian theology. 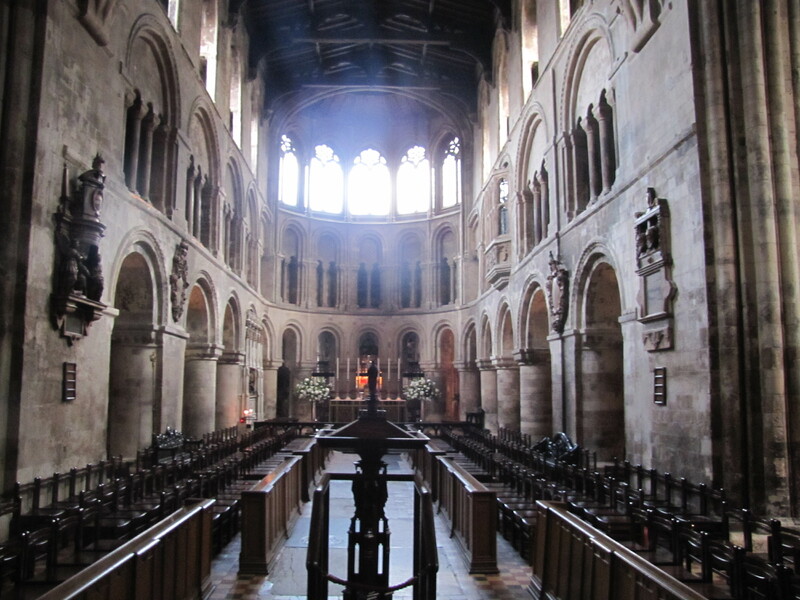 Yesterday I ventured over to St. Bartholomew the Great, just a few blocks away from the Museum of London. It’s the oldest active medieval parish church in London, so naturally I had to see it. (Bonus Fact: Parts of Shakespeare in Love were also filmed there.) I wasn’t sure what to expect as I was walking up to it; the church was set off from the main road. The gate you have to go through is where Richard II stood when he met with the leaders of the Peasant’s Revolt. Upon entering the church and paying my meager entrance fee (3 pounds), I was asked where I was from (Apparently the smiling gives it away if the accent doesn’t…) and handed a guide of the can’t miss bits. As I walked through, I got a since that this was what Westminster Abbey would look like if it hadn’t been messed with and wasn’t always undergoing some form of renovation. I passed the medieval baptism font (where interestingly enough, Hogarth was baptized). There was modern art throughout that the church had commissioned to take the place of older pieces and to go over empty spots on the wall. I was somewhat annoyed by this, but I felt that it added a living dimension to the church: it’s still shaping its image, showing its continued importance. Sounds a bit like Westminster Abbey with famous bits so far. Well, it was, but considerably less magnificent. Then, I stumbled upon the video that told the church’s history. Think the history lecture we got at the synagogue but extended to include how the church is still active in the parish. (On my way out I noticed there were pamphlets on what to do if you wanted to get married there, join the church, or have a christening.) The video addressed almost every issue, especially how the church is still relevant today, that people had raised. By the end of my visit, I had felt that I had an experience more akin to those at the other places we visited. 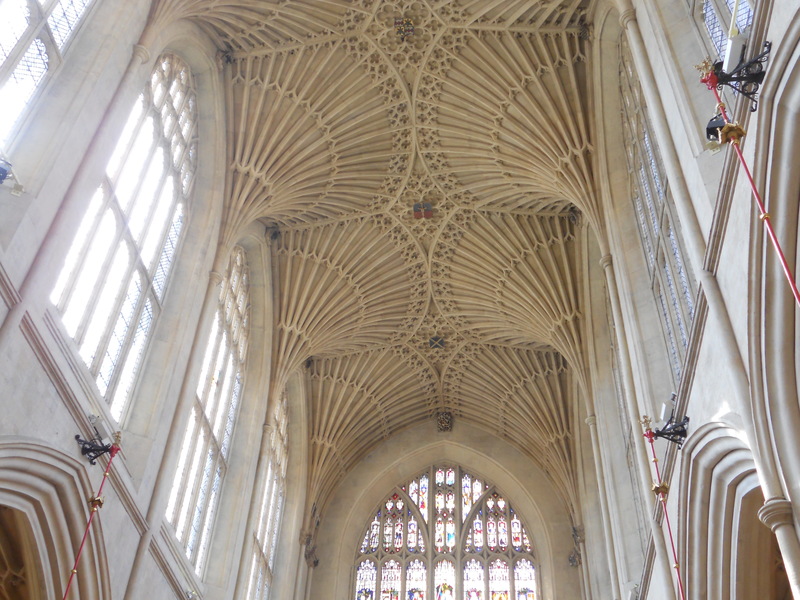 If I had had a lay guide I am positive that I would’ve felt that I were there as a visitor rather than a tourist. We Will Rock You… with Church Songs? From the various services/presentations/synopses of religion we attended, it appeared that Christianity in London is dead. 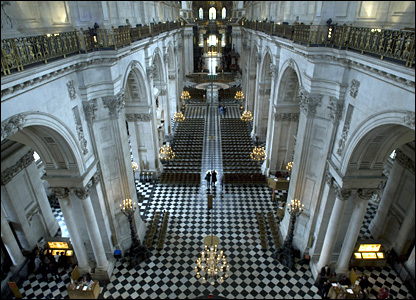 The two major Christian establishments we attended as a class, St. Paul’s Cathedral and Westminster Abbey (and technically, the abbey out in Stratford-upon-Avon, but that was quite a quick visit), did not appear to have any sort of religious community. Well, that’s not exactly a surprise – these locations are such tourist destinations it would be almost impossible to have services, or a regular church membership. However, this does not mean that Christianity is dead in London. Yes, its true that a large majority of those who consider themselves Christians, or more specifically Anglicans, subscribe to a small amount of Christian beliefs. In this way, the reported statistics of adamant Christians are quite inflated, as noted in the readings. Well, Andrew and I decided to attend a Christian service this past Sunday, and it was really something. The normal preacher introduced an energetic Australian as the guest speaker, and his sermon was on the prosperity gospel. Andrew and I both agreed that he was very well spoken, very entertaining, and the message he was describing was great. However, he was much funnier than many preachers I’ve seen in the States, and overall much more animated. I was literally laughing quite hard for some of the service (a bit awkward to do in Church normally) and really enjoyed his sermon on the whole. Overall, it was a great experience. It was a very involving and exciting, which made a lot of sense as we further discussed it. Churches in England are, like all Churches, trying to attract more people, especially young people. They emphasized this in their explanation of how important community is to them, and had a video on different groups you could get involved with. This Church’s communities are everywhere; it was really quite impressive and cool. Perhaps this extra flair is added to the service to try and rouse faith in a generally lacking Christian body in London. I doubt this service is representative of all Christian services in London; however, I found it encouraging and informative to see that Christian services do exist here outside of St. Paul’s and Westminster Abbey. All the people seemed really quite friendly, and they even shook our hands (take that Kate Fox!). Though I am not sure whether Hillsong has an information session like the Mandir or Mosque, it would certainly be interesting to investigate. It might be a bit hard for them to hold something similar, as they have no permanent building. Last bit: I was fascinated by two other features of the service. One, the ethnic diversity of the people. We have learned that London is an incredible myriad of cultures, and this cultural mélange was really reflected in the audience. In my row alone, there was a Latino family, several Afro-Caribbeans, and an Asian woman, plus two white kids (me and Andrew). I thought it was really neat to see London’s diversity reflected in the church audience. I found this to be a bit different than the Mosque and Mandir, and I can’t say for the synagogue (saw very few people in there). Lastly, the Englishness of the service in some ways. There were a ton of cultural references that neither Andrew nor I understood, but everyone else found quite funny. It was like being on the outside of an inside joke, but we still laughed to not be awkward. Anyway, I don’t think this would happen as much in America. I think Americans are much less aware of their culture than to do this, but the Brits certainly aren’t.